I’m constantly trying to find ways to reduce our spending and increase our savings. Money saving apps are definitely part of that strategy. 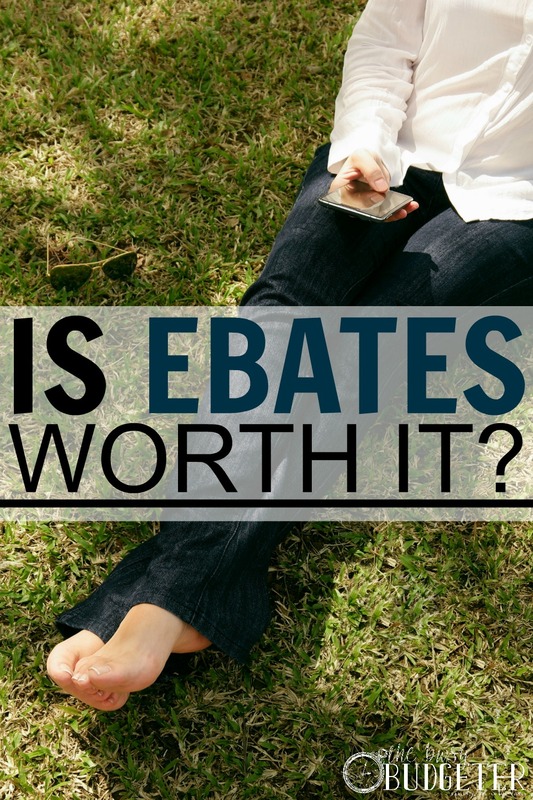 So when a reader asked me “Is Ebates worth it?”, I jumped at the chance to put it to the test. Some, like Swagbucks and Inboxdollars (that pay you to take surveys) I don’t recommend unless you have lots of time and no other way to make additional income. Do people make money from them? Absolutely! Some, do really well with them. But, most of my readers are extremely busy and don’t have the time for that. Some apps like Ibotta (you can find my Ibotta review here), are totally worth it for everyone and I fully endorse! I personally try them all, to vet out which are worth it and which aren’t. You can find my full list here. What is Ebates and why should you care? Ebates is a crazy easy way to get a cash rebate on almost all of your online shopping. It’s completely free to use! You enter the online store from Ebates and boom… a percentage of your purchase gets returned to you by Ebates. That’s it. The percentage can be anywhere from 2%- 30% (I average around 6%). Ebates came up on my radar a few years ago from a friends recommendation. She’d made just shy of $500 through Ebates that year by getting a cash rebate on your online purchases. This is so easy that anyone could do it. But just to show you, I recorded a quick video so you can see for yourself exactly how easy it is. It takes seconds! You can find the video here if you need help. Go to the Ebates website. Search for the store you want: like “Amazon” or “Target”. It will tell you the percentage of cash back you will get for that store. Click the “shop now” button. It goes right to the store and you complete your shopping like normal. It’s easy! True. If you prefer to shop in store, it won’t help you. Ebates only works online. However, I save a ton of time and money by shopping online. I don’t have to worry about impulse purchases, I can sort gifts and products by lowest prices and I don’t have to carry two kids around a store. With free shipping and free returns at most stores, online shopping is how I automate most of my errands! Yep! They do (and probably a lot!). The stores pay Ebates to send them customers. You’re kind of hacking the system a little. I’ll give you an example: You need to buy Christmas gifts, and you know that Ebates will give you 8% of your purchase back at Amazon, so you go to Ebates first, then enter Amazon.com through them. You spend $100 buying Christmas gifts for everyone. Amazon pays Ebates $10 for sending you to them,Ebates pays you $8 for going through them (and making them $2). Amazon is happy because they get more customers, Ebates is happy because they make money, you’re happy because you get money back…It’s a win/win/win. We use Ebates and Ibotta to pay for our Christmas, which is a super win! Heck yes!! I’m cheap man! Even I spend over $2,000 online every year. That’s an insane amount of money to me! Ebates gives me the opportunity to earn a percentage of that money back. Why in the world would you say no to free money that takes almost no effort on your part to earn? If you really want to hack the system, do what I do: Let your Ebates earnings add up to pay for next Christmas, cash out in November and then order all of your Christmas presents online using Ebates, so you earn cash back on your cashback earnings! (This is the stuff that I can’t shut up about). You can sign up for your FREE ebates account here! I focus really heavily on balancing work and life. One of the smartest things I’ve ever started doing is automating my errands. You can read more about how much time and money that saves me here, but it’s a lot! I focus on finding better prices online than in the store for everything that I need to run my house, and all of my personal items (like shampoo and deodorant). I find ways to get them shipped to the house for less than I would pay for them at Target or Walmart. It works amazingly! Using places like ePantry and Amazon Subscribe and Save, I completely eliminated trips to Target and Walmart and have everything delivered to my door. Thanks to Ebates, I get a percentage back on literally everything I buy to run my house! Which is cash that I can spend on treating my family to something that we otherwise couldn’t afford. You can sign up for Ebates here! What do you always buy online?